In my last Bird-a-Day Challenge update post, I briefly mentioned the bird I used for February 27th – a Lesser Black-backed Gull. Here is a little more about this special bird, F05. He is famous. Since 2007 this bird has been observed as part of a mated pair breeding on Appledore Island in Maine. 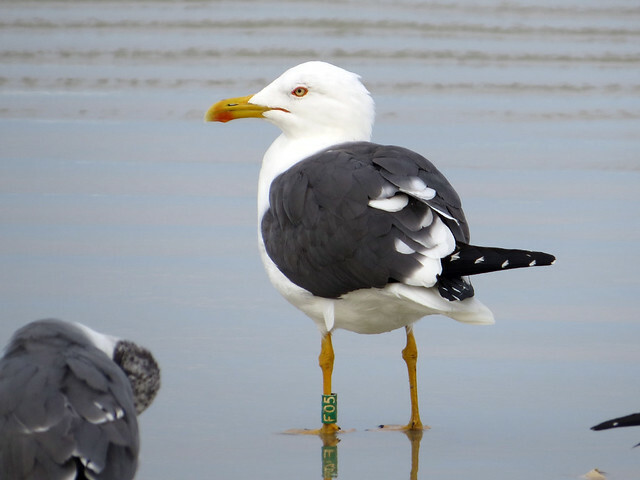 This is remarkable because it is only the second record of a Lesser Black-backed Gull (LBBG) breeding in North America, and the first record for the east coast. The female mate is a Herring Gull. Gulls generally tend to be monogamous, though F05 is known to have had at least three mates (along with a bit of drama) since 2007. F05 and his mate(s) raised chicks that survived to fledge in 2007, 2008, and 2009. After an off year in 2010, F05 and a new mate raised a chick successfully in 2011. In late January 2009 F05 was first seen wintering on the beach in Daytona Beach Shores, Florida, during the Space Coast Birding Festival. F05 was seen wintering in Daytona Beach Shores again in 2010, in 2011, and in 2011-12. After being seen over the winter of 2011-2012 in Florida, F05 was not seen at all during the 2012 summer / breeding season on Appledore Island. He was presumed dead until this January, when Michael Brothers (the original finder in 2009) spotted F05 once more in Daytona Beach Shores. And he was still there on February 27th, when Arthur and I spotted him among the thousands of gulls on the beach that late afternoon. The gulls return to Appledore to begin breeding in May. Time will tell if F05 will join them. This entry was posted in Banding, Florida. Bookmark the permalink.